Bad: Will this title surpass its peers? Adeptus Titanicus Dominus, the latest title from Membraine Studios, is yet another title based on the Warhammer 40K universe. Membraine Studios is a small indie team based in Sydney, Australia and comprises of Glenn Osmand-Mcleod and Mark Sheppard who are fans of the tabletop genre themselves and have almost two decades of game development experience between them. Warhammer 40K has an enormous loyal fanbase and titles honoring the universe pop up quite frequently, but unfortunately not all of those titles are worthy of a playthrough and this title is one of those that is not (yet) worthy. Adeptus Titanicus Dominus currently has no overarching storyline as it is still in Alpha Phase (Early Access Game on Steam). 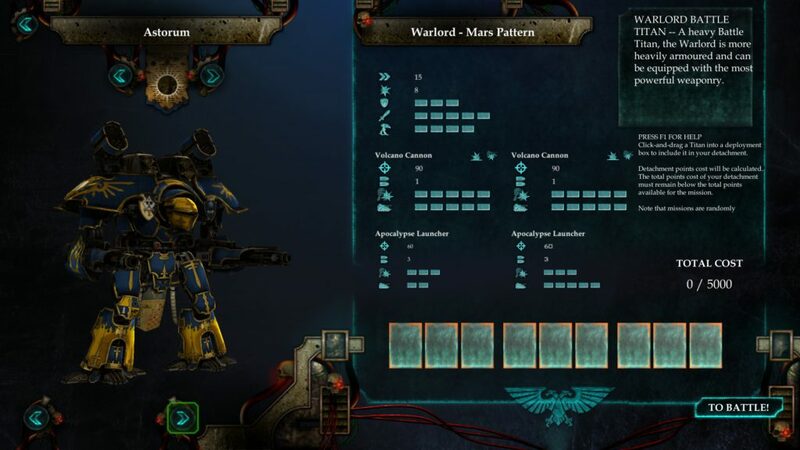 You control Titan-class mechs from different factions such as the Legions of Astorum, Gryphonicus, Crucius and Osedax for the Imperium side and Mortis, Vulcanum, Damnosus and Fureans for the Chaos side. It is based on the Titans Legions Board game from Games Workshop from 1994 so it stands to reason that they will focus their storyline on that aspect of the universe. Regarding the graphics of Adeptus Titanicus Dominus it’s hard to think of anything positive to say. Overall everything looks like it belongs in the early 1990’s or on a modern day low budget smartphone application. The level of detail on the Titans and the environment is appallingly low for modern day standards, explosions are extremely underwhelming and the UI is very basic while still being somewhat userfriendly. The soundtrack is well chosen and fits the gloomy aspect of the Warhammer 40K universe. Explosions and movement of the Titans are not conveyed properly: a lot of work still needs to be done to bring the entire gaming experience up to a level where it becomes enjoyable for the player. Adeptus Titanicus Dominus is top down turn based strategy game which revolves around controlling mechs and winning the battle in 4 rounds or less. Right now, you can choose out of nine Titan variants with different specializations (on paper) which can be used on three battlefields. Each weapon has a range, rate of fire and level of impact against heavy or light opposing Titans but it will take a lot of trial and error for the player to figure out of his setup is any good when the fighting starts. The stats of the weapons feel like they have been chosen at random (rate of fire for example uses ratings that range from numbers to text such as 1 and barrage weapon). The play modes are very limited: you have a brief tutorial, online and offline skirmishes (which only last for four rounds and at the end the winner is chosen based on surviving Titans and controlled check points). You start each battle with the chosen Titans and have four rounds to defeat the enemy or control more check points than the opponent. The flow of the game comprises of three actions: selecting your Titan, moving it and, optionally, attacking an enemy. When you have selected a Titan, and decide to move it, you can simulate where your Titan will end up and its relative location towards the enemy Titans. You are also able to simulate an attack on an enemy Titan to see how effective your chosen path would be. This takes away the RNG aspect of the game as the chosen actions are always executed as they are portrayed. Battles lack excitement, depth or just anything that doesn’t want you to alt tab while the fight is taking place. It feels as if actual table top fights are more engaging than the battles that take place in this title. There are no animations for the different weapons that are used, just fluorescent lines flying from your Titan to the opposing one or the other way around. 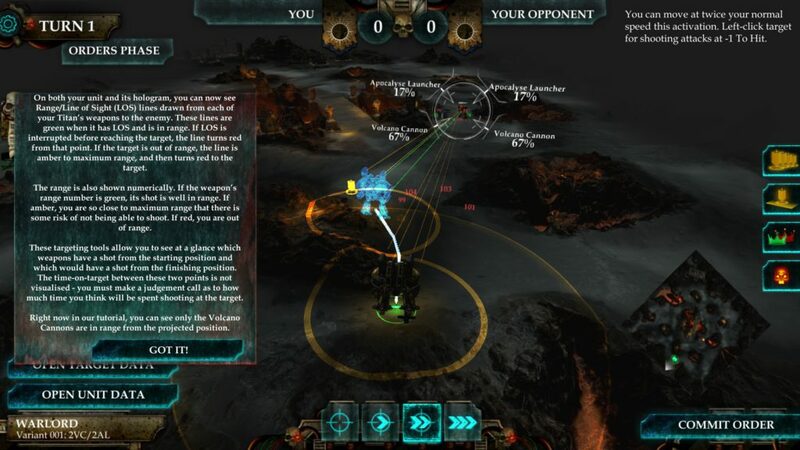 The battlegrounds on which you are able to play are barren and very little interaction is currently possible with them so trying to gain a tactical advantage apart from making sure your Titans remain not targetable during the opponent’s turn is not possible. As this title is still in Alpha Phase, there is still a lot of room for potential. 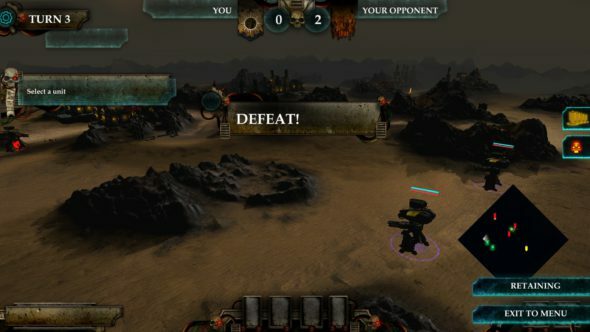 Adeptus Titanicus Dominus is a very rough alpha build of yet another Warhammer 40K based titled. A huge deal of work still needs to be done to bring this title up to an acceptable level for modern day standards and based on the limited size of the development team it does not look like this will happen soon. The gameplay is too basic and the visual aspect does not keep your visual desires sated. If you are a huge fan of Warhammer 40K and have no issue with spending some money to support an indie developer with the same passions as yourself, this title is worth getting picked up. Everyone else should wait until there is considerable progress, or until it’s clear in which direction this game is headed.